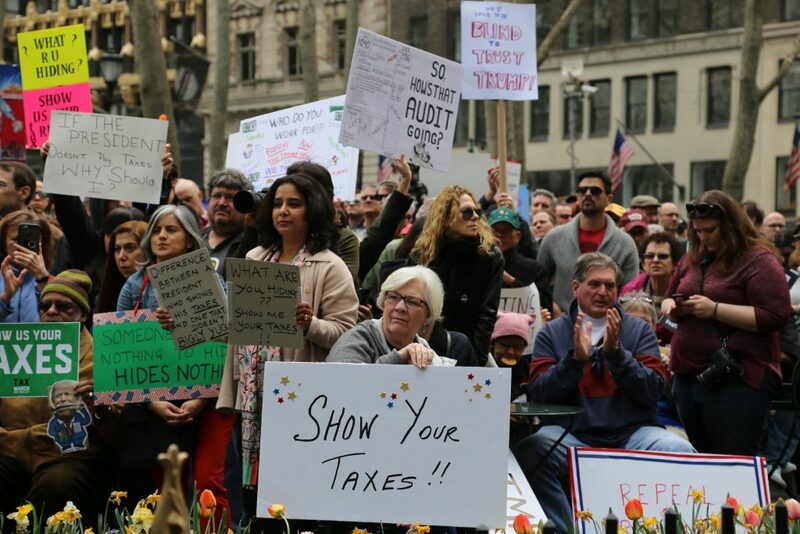 Demonstrations took place Saturday in U.S. towns and cities to call for President Donald Trump to release his tax returns, just days before Americans file their own taxes by the April 18 deadline. The idea for the demonstrations, called the Tax March, began with a tweet by Vermont Law School professor Jennifer Taub, the day after millions of demonstrators met around the world for the Women’s March in January, in what was widely viewed as a reproach to Trump on his first full day in office. The tax protests, which were planned in at least 40 states and five countries, were organized mostly by progressive groups and with the support of some Democratic lawmakers and members of the Working Families Party. The demonstrations come as Trump prepares to release a plan for the country’s first major overhaul of the U.S. tax system since the 1980s. After an initial deadline was set for August, Trump has indicated that he would unroll the plan late this year. Americans from both sides of the political aisle view the tax system as unfair, and the majority of people in the country believe that Trump should release his taxes, according to the Pew Research Center. Trump has so far declined to release his taxes, citing an ongoing audit by the Internal Revenue Service, after stating on the campaign trail that he would make his personal tax information available to the public. Tax experts say there is no law barring Trump from from releasing his returns during an audit. Trump’s aide, Kellyanne Conway, raised new questions over the issue when she stated in January that the president would not release his tax returns, a disclosure of financial information made by every president for nearly 40 years and one that advocates and voters believe is important to guard against possible corruption. Presidential tax disclosures are not required by law, but at least 24 state legislatures have introduced legislation aimed at forcing future presidents to release their personal tax information before taking office. Similar efforts by Democratic lawmakers in Congress have failed to gain traction. Delvone Michael, an executive committee member for the Tax March and a senior political strategist for the Working Families Party, told the NewsHour Weekend that the country should know more about Trump’s financial information to avoid conflicts of interest. The largest march was planned for Washington, D.C., amid dozens taking place across the country. Thousands there called for Trump to release his taxes before marching down Pennsylvania Avenue. 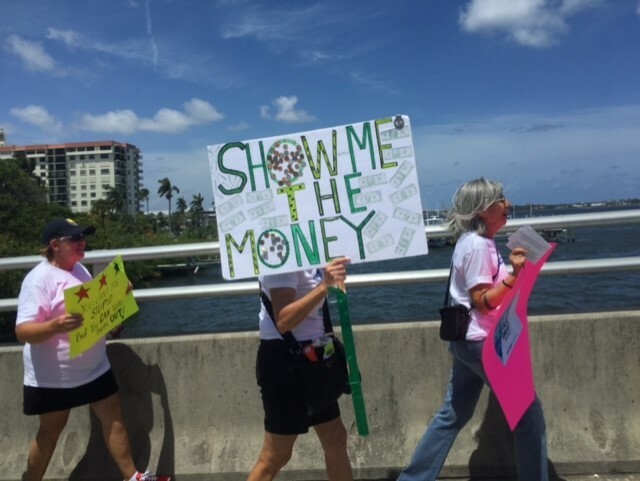 Demonstrations also took place in Florida outside the president’s Mar-a-Lago resort, where he spent the weekend. 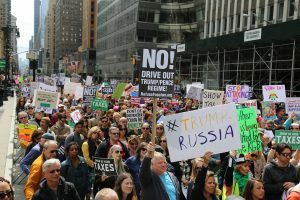 In New York City on Saturday, upwards of 5,000 people congregated to listen to a stream of government officials, advocates and actors who railed against the president’s first few months in office, before the crowd marched to Trump Tower. 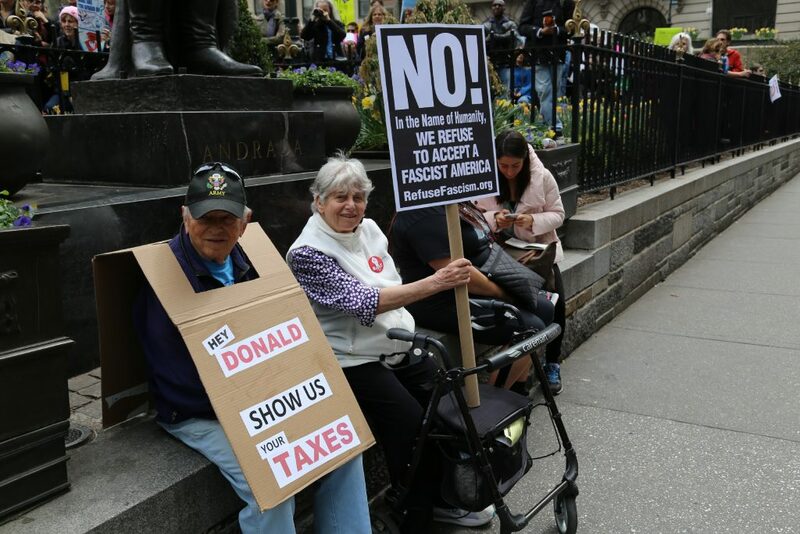 The demonstration seemed to be as much about overall dissatisfaction with the first few months of Trump’s presidency as it was a call to release his taxes, with speakers and protesters also criticizing his actions toward immigrants, recent military actions and his frequent trips to Florida. “This is not a dictatorship, this is a democracy,” he said. Others called for the country to press for more transparency from Trump. Gary Schippy, 63, of New Jersey, said he decided to attend the march to express his displeasure over Trump’s presidency. Francois Dongo, of Connecticut, said he traveled to New York for the march because he’s upset that Trump has not released his taxes, just as every president has since the 1970s. “Why is he the only one that won’t do it?” he asked.